This article (now updated and clarified) was originally published elsewhere in June 2011 as Congress lurched toward the debt ceiling and a credit downgrade for America. Since then we have seen our nation of sheep become a nation of lemmings as Washington raced to the edge of the fiscal cliff at the end of 2012. Having dodged another credit thrashing, our Congress has two more opportunites; the impending slow motion Sequestration train wreck and yet another debt ceiling tug-of-war. All the economic experts, bi-partisan commissions, budget czars, think tanks, and academics will have statistics, formulas, historical data, and projections to justify myriad proposals. Some will gain enough clout to become fact; some will even work. 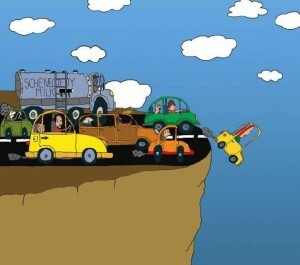 However, the national discussion on regaining fiscal sanity could benefit with input from the bottom; U.S. citizens. It’s well past time that the government sought counsel from the Great Unwashed. Here are some observations of areas where the debt and deficit could be improved and the need for sequestration rendered moot. During 2011 (and more recently) there has been much hand-wringing and teeth-gnashing over the debt ceiling accompanied by occasional posturing about a Balanced Budget Amendment. If even half of the proposals below were implemented, it would be possible to begin to lower rather than raise the debt ceiling. Balanced budgets are mandated constitutionally in most states and could be for the federal budget also. Just don’t expect that balance to happen very soon even if a grass roots generated amendment finds it’s way into the Constitution. Both parties have seen fit to raid the Treasury on behalf of the companies which caused the financial collapse. During the 2010 midterm and 2012 Presidential elections neither had the hair on their hindquarters to tell their corporate sugar daddies that TARP would not be revisited. That the executives of the institutions involved in TARP participated in the feeding frenzy should hardly be surprising, but their bonuses were overshadowed by a far larger misuse of those funds. When the furor began over the AIG bonuses, it was also revealed that much of $30B+ went to counterparties in Europe. Companies which received TARP shared the wealth via bonuses when it was not theirs to share. In fact, their response to TARP was to hog far more in bonuses (at taxpayer expense) than their companies even earned as profit. (See the 2009 video below.) A substantial tax penalty (70% or better?) on these bonuses would have brought in $Billions which could be used to buy back some outstanding debt and discourage future pillaging of the public purse. The so-called “living will” provision (for institutions of such proportions that they pose a systemic risk) is a worthwhile objective which has found its place among reasonable solutions. In short, companies deemed “too big to fail” were put on notice that they have become “too big to BAIL”. If the international mega-institutions get the message of being exactly that they will be duty bound to their investors to have adequate reserves. Those that then do fall (Lehman, Bear Stearns, et al.) will be absorbed by the survivors of their collapse. (In fact, the consolidation of financial institutions has resulted in even larger companies than before 2008.) Recall now that even in the process of being absorbed by Bank of America, Merrill Lynch burned their shareholders for $3.6B in bonuses. “The bonuses became a subject of the investigation into Merrill’s merger with Bank of America by Cuomo’s office after the Attorney General raised whether the two banks — which together received about $45 billion in taxpayer dollars — worked together to arrange the early bonus plan just weeks before the merger was completed. “Cash for Clunkers” packages were spread much broader than they should have been. If anything, they should have been restricted to Ford, GM, and Chrysler. Japan should have done the stimulus for Honda, Toyota, and Nissan. Besides, Detroit didn’t have this coming; they had already been bailed out. The point here being that not $1 of TARP, or any other stimulus package from the U.S. Treasury, should have been allowed to leave the U.S. economy. There has been discussion of federal wage and hiring freezes. The proposed freezes were a half measure which played to the crowd, but did little to reduce the debt or deficit. In 2009 Irish government employees were notified that pay cuts of 5% would be the burden of the lowest paid with reductions up to 20% for the highest pay grades. Considering that government jobs in the United States pay better than the public sector, a 5% cut should be fairly painless. An appropriate exception would be for the military. They should get a raise so they don’t have to rely on food stamps to feed their families. (Pay for these raises by not renewing contracts with Halliburton, KBR, etc.) The functions performed by these corporations were the traditional function of the Military Sealift Command and the Quartermaster Corps and should be handled by them. It should also be noted that with the Presidential election over, the freeze was going to thaw just in time to mitigate the effects of sequestration. Another idea in circulation was to stop replacing federal employees who retire or otherwise leave government service. These suggestions, taken together, would result in the painless downsizing of government. As for hiring, the Obama administration has established new Czars (with mushrooming staff) and packed existing agencies with the likes of the 16,000 IRS rookies. Is there anyone who seriously believe that these are the jobs America needs? This is a way of creating jobs, but at the cost of increasing the debt. It was reported in 2011 that corn had risen 52% in the previous year (2010). In these circumstances, the agricultural subsidies extended by the lame duck congress with the Bush era tax breaks were unnecessary and obscene. 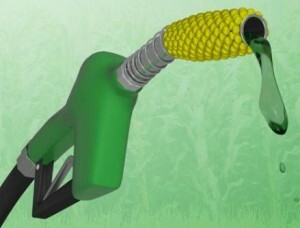 In 2012 the drought made the price of available corn skyrocket since much of it was reserved for fuel. In 2013 there will be an impact on the cost of food both in the US and abroad (see quote below) since there will not be as much volume to export or feed livestock. And why wouldn’t this mandate change? Think back to the beginning of the Presidential Primaries. One of the critical states for any candidate in either party is Iowa (corn country). Thus the Iowegians hold both parties and all contenders by the short hairs. Investor nations will not want for plentiful sources of government debt. Portugal, Greece, and Ireland will be glad to accommodate China and Japan. Shown below are the pie charts (shading added) from the 2012 1040 Instruction book (p 104). In these charts Defense and Foreign Affairs (24%) is far larger than what is shown as having been spent on the debt (6%). The great difference between the amount expended for interest in the ’80’s and now could be attributed to the difference in interest rates. However closer examination would reveal that the amount spent on the debt is only on interest. On the income side 36% is designated as coming from “Borrowing to cover the Deficit”. Yet there seems to be no portion of the budget used for paying anything on the principal on the spending side (kicking the can down the road). For individuals, there seems to be universal agreement that the tax code needs to be simplified. The various proposals range from dumping it in favor of a national sales tax, to a flat tax, to giving up some loopholes for a reduction in rates. Russia, with a 13% flat tax, is now attracting the wealthy from European countries which have high top tax brackets. For businesses . . . It may be worthwhile to add an incentive for U.S. corporations over foreign. The means for this would grant a more favorable rate to companies doing at least 50% of their business in this country, making at least 50% of any products in the US, being at least 50% owned by U.S. Citizens, and hiring U.S. Citizens as at least 50% of their employees (with all immigrant employees certified as legal residents). Why? To stimulate domestic production (think: jobs) and reverse capital flight to foreign tax shelters. This would also level the playing field for US companies versus multinational corporate competition. Also, instituting an encouraging tax structure for business in America would stimulate investment here. Britain has attracted foreign investment with favorable tax rates seen as the most business friendly worldwide setting a good example for the US. There is a longstanding tax dodge being used by multinational corporations which allows tax to be deferred on foreign profits. “Offshore deferral encourages companies to use accounting techniques to record profits offshore, even if they keep actual investment and jobs in the United States.” More recently, this game of smoke & mirrors saw the light of day again as reported in The Wall Street Journal. “There’s a funny thing about the estimated $1.7 trillion that American companies say they have indefinitely invested overseas: A lot of it is actually sitting right here at home.” Now there’s a a loophole you could shove the Empire State Building through. According to the Journal article, the corporations doing this have been lobbying Congress to end the tax liability altogether. Now refer back to point #1 … tax incentives for American companies that are independent of multinational corporations could result in Walmart USA and GM America as separate from the globalists with American interests first. The United States is flush with assets which generate income through various lease arrangements such as oilfield and grazing land on government owned property. This may be an appropriate time to review those lease arrangements to see which are coming up for renewal and should be at a new rate. Some assets which are not contributing to the US Treasury could add to our national income. The Corps of Engineers operates navigation locks on many inland waterways which could have at least a nominal toll. For example the locks on the St. Lawrence Seaway processes a huge volume of traffic but are not even self sustaining. There is also a longstanding tradition of the old fashioned church bazaar or neighborhood garage sale that could net $Billions to pay down our collective debt. 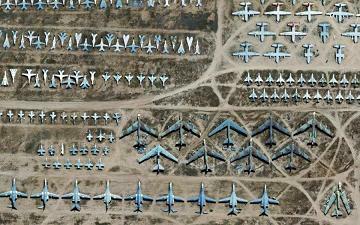 For instance, America has a mass storage of mothballed Cold War era planes which will likely never be reactivated. Some could go to museums, others could be refitted for civilian tasks such as disaster relief flights or refurbished (more jobs) for sale to other countries for their air power needs. Some of them (B1 or B52 for example) may never be sold to other countries, but some outdated fighter planes could be. sell excess federal assets, including buildings, land, and inventory. Recalling the 50% (or more?) American owned, operated, and staffed business guideline suggested above for tax reform, this would be an appropriate standard to apply to companies wishing to take over government functions. It would be inexcusable to allow operation of the national infrastructure to be at the mercy of foreign ownership. Likewise it would be just as irresponsible for cronyism to allow for no bid or secret auctions to result in monopolizing of these vital businesses. We could wind up with the situation of companies like Halliburton (as mentioned above) controlling the electrical grid, Post Office, Amtrack, etc. with no transparency to ensure legitimate competition for those assets. As for Social Security, one overdue change which gets little discussion is to change the limit on wages subject to the tax which supports our elderly. During the darkest days of the financial collapse, the FDIC considered it prudent to raise the limit on protected deposits from $100k to $250k. Indeed that change was likely helpful in preventing a run on many wobbly banks. Even as the limit on deposit protection was timely, it is noteworthy that the $113,700 (for 2013) ceiling on income taxed for Social Security is just as outdated. This limit has been rising incrementally. But even with our income tax considering $200k as middle class, there’s no reason it shouldn’t be considered as taxable for Social Security. The result of the current situation is that those who will need it most in their retirement are supporting those who need it least now. One way mentioned to make Social Security last would be to make it needs based. But the wealthy who have contributed to it are as eligible as other taxpayers. It may be workable, however, to encourage those who could do without it to take a tax break in some portion of the amount of their Social Security by letting it stay in the fund or go toward our towering debt ($16.5T+). By far the best fix for Social Security would be to put Congress on it like Joe SixPack and watch it become quietly solvent when it is no longer raided for pork projects. The practice of get-elected-once-get-paid-for-life is no longer sustainable with $Trillions of debt. Besides our elected officials are NOT Royalty. Sequestration should be a last resort to solving our fiscal problems since there are other options such as those listed above. However, it could be a useful tool, administered judiciously, instead of being used as a poison pill for political purposes. When plugged into the agreement on the debt ceiling in 2011 “The Budget Control Act states that the committee’s goal is to achieve at least $1.5 trillion in savings over the 2012–2021 period.” After the deal was done, there was lots of time to set up something similar to the Base Closure and Realignment Commission to put together a rational means of making cuts that all could agree to. But first there was a Presidential election to contest … then the Fiscal Cliff crisis to quell. Now with Sequestration looming, lawmakers are sweating bullets over local impact. As the battle in DC grinds on over budget brinksmanship, the debt ceiling, the fiscal cliff, sequestration (etc, ad nauseam) the shock factor has begun to wear off. The public has started to become jaded to the pronouncements of impending doom. Even after sequestration kicks in, there is still no budget in sight (although due) and there is yet another debt ceiling to wrestle over. John Q Public knows that when Congress finally recesses they go on vacation and he gets to figure out how to get by. Joe Average will be setting up a garage sale or putting stuff on ebay to get gas. Nancy Pelosi flew on our tab. As a result of a Judicial Watch filing under the Freedom of Information Act, the USAF released documents detailing House Speaker Pelosi’s use of United States Air Force aircraft between March 2009 and June 2010. Total trips: 85 trips over a 68 week period or 1.25 average trips per week. Cost to the taxpayers: $2,100,744.59 or $27,715.00 per trip or $1,285,162.00 per year. Cost of in flight food and alcohol: $101,429.14 or $1,193.00 per trip or $62,051.00 per year. 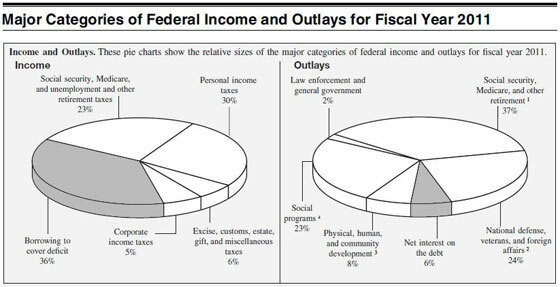 The means to fiscal sanity are listed above along with the abuses by the elite foisted upon the nation. If even some of the suggestions are applied and the spending binge brought under control, national recovery could begin. Finally, we see that Marie Antoinette (“Let them eat cake.”) and Leona Helmsley (“Only the little people pay taxes.”) are alive & well in DC. TARP, HAMP, “Clunkers”, etc. have revealed that both parties have embraced Supply-side Reaganomics. Jack Kemp would be proud.